There is so much emotion in this image during the vows with Christina and Nick! They had their ceremony and reception at the Avanti Mansion in Buffalo. They both also got ready there and we did all of the portraits there. It is a gorgeous location! We love this image! This was my angle! For the vows, Neal usually always goes to the aisle. My camera stays on the bride and groom, no matter what. Nick was reading his part of the vows. They both wrote their own! You can see some of the words he typed up too! Christina began to cry. I think everyone did! She had tissue in her dress, which most bride's always do! 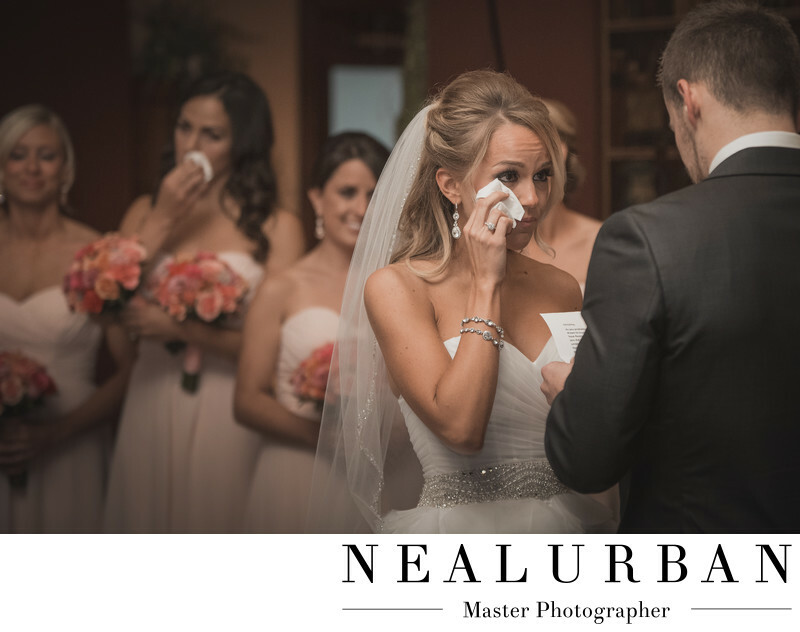 I love how she is dabbing the tears away, but keeping her eyes directly on the groom. The bridesmaids in the back complete this image too! One of them had to grab a tissue as well because she started to cry. Another girl has a giant smile on her face! The bride and groom had a candlelight ceremony! It was beautiful. There were candles everywhere. They had huge vases lining the aisle and on the fireplace behind them. They also had votives all along the windows. The curtains were drawn for a nice intimate feel. It was beautiful! Location: 4409 South Park Ave, Buffalo, NY 14219 United States.